Kitchen and Residential Design: Why why why Delilah? That's the name of a Tom Jones song and it has nothing to do with this post. Well, I suppose I'm about to shake my fist at the sky and shout "Why?!" The similarities stop there though. I am spending the better part of this weekend drawing my heart out and coming up with great rooms for clients. As I'm wont, I have the TV on low in the background to provide white noise. I'm working on another floor plan and the project in question is the back end of a house. We're removing a bunch of the interior walls and creating an open floor plan to replace the rabbit warren of hallways and small rooms that are in the space now. When this is all said and done, the family room, the kitchen and the dining room will all be in one big space. Even though I don't sell furniture or carpets, I usually end up specifying the furnishings that go into the rooms I draw. So as I was sitting here, drawing away contentedly, I heard a commercial for Rooms to Go that jarred my out of my reverie. 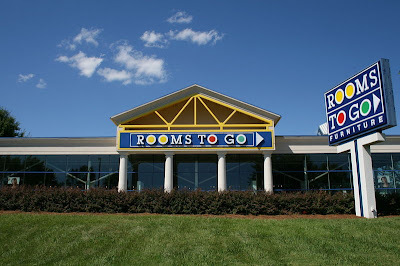 Rooms to Go is a chain of cheap furniture stores in the South that specializes in selling entire rooms of matching furniture at once. It's all bad --poorly designed and poorly constructed imported garbage that will end up being thrown away in five years. They are running a special this weekend where they're giving away a 40" flat screen TV with the purchase of one of their $1900 living rooms. My eyes burn when I have to look at stuff like that. Sheez-oh-man, I get it that there's plenty of room in this world for everybody's tastes, but this stuff is beyond the pale. And here it is with no people in it so you can better imagine yourself reclining in this luxury. Imagine, drink holders and snack trays built right into your sofa! No wonder Americans are so bloody fat. They ought to call this the Lethargy Sofa. It gets worse though. 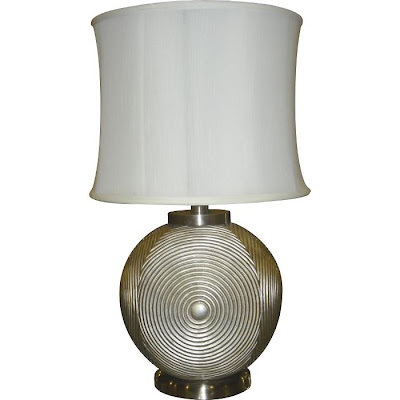 To the left of the guy in the second photo is a white table lamp. This is it. Again, ouch. They are throwing this in with the $1900 living room suite as a bonus. I don't understand what would prompt someone to waste money on crap like this. In addition to being poorly made, it looks terrible. That Lethargy Sofa up there retails for $1199.99 when it's purchased on its own. 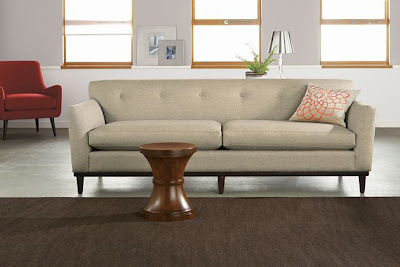 For 99 cents less, you can have the 84-inch Eugene sofa from Room and Board. The Eugene is made in the US, it's tasteful, it's well made and will last forever. Finding reasonably-priced, well-made furniture is not difficult but it does require a little legwork. You don't have to chose between Rooms to Go crap and a $10,000 heirloom-quality sofa. Really. There's a nearly unlimited number of options between those extremes. When it comes to furniture, how it's made is more important than who made it. Do a little research, find out what makes a good sofa a good sofa. I wrote a piece on sofa construction back when I was just starting out as a blogger. Check out Sofas, Sofas Everywhere but not a Place to Sit from February, 2008. And now that that's out of my system I can get back to work. 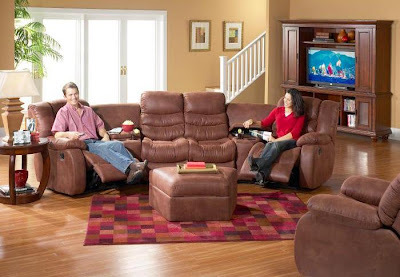 Trying to design around a recliner is a nightmarish thought in itself...They're just plain UGLY. Then somebody had the bright idea of linking them together into one BIG blob of UGLY. Must have evolved as a result of the TV remote. Now nobody has to get up to switch the channel on the UGLY TV. Funny, whenever somebody puts a TV in a livingroom design, the thing that attracts me the most is the ingenious ways they come up with concealing it (even the flat screens). Amusing to me is the top picture --they just placed the 'entertainment center' to the backs of the seating arrangement --I guess so you don't have to look at the ugly thing. Kinda defeats the purpose though -HA! Look at the bright side Paul -those who appreciate design enough to hire a designer are not the ones who will be inspired to buy a reclining blob. TV remote-inspired sectionals are bad enough, but this thing has snacking in mind. What's next? Adding a refrigerator? It bothers me that this kind of garbage furniture is what a lot of people think of as nice. I think it's some kind of a failure on the part of the furniture industry and the whole design world. Inexpensive furniture doesn't have to be hideous and it doesn't have to encourage sloth and gluttony. No apologies! Especially if it involves news that you're moving away from the ever wretched 20/20. The last software update for 20/20 is what did it for me. It set me back to square one. I just wanted to CRY! Chief on the other hand is like Old Faithful-- only it gets better instead of worse! We have enough problems (like dealing with unavailable or incomprehensible appliance specs and overpriced crap setting the standards for furniture design)... we don't need no stinking software headaches! I was so mortified by the latest version of that crap 20/20 I won't use it. I'm still on 6.4 with no intention to change any time soon. I call their tech support and complain every time their crappy software so much as hiccups. If I have to pay that annual maintenance fee, then they have to listen to me shrieking complaints. 20/20's lousy software and cheesy furniture, lighting, etc. pushed me into the waiting arms of SketchUp, so I suppose there's a happy ending. All I can say is: "Pass the corn-pone." If the sofas could be used as caskets after their short useful life in the living room, they'd be complete. of course, in full agreement here- and have posted as such, many times! Unfortunately, that would require the producers of this stuff to give some thought to long-term consequences and long-term use. Come on Peter, why worry about the future when there's money to be made today? Ugh. Christian, if I'm offended by this, I can only imagine the fits you get from these sorts of things. It must be like bad-furniture-induced epilepsy. That monstrosity won't be complete until there are crushed cheese puffs and pop tarts in the cracks and spilled Budweiser on the cushions. Don't forget the sweat stains! I love Room and Board too Kelly, I spec stuff from them all the time. And you are exempt from my made in the US demands. You buy all the Canadian stuff you can get your hands on. Think globally, but screw globalization. Sara that's a good one. Peter suggested coffins and you're suggesting hospital beds. I think you two are onto something. 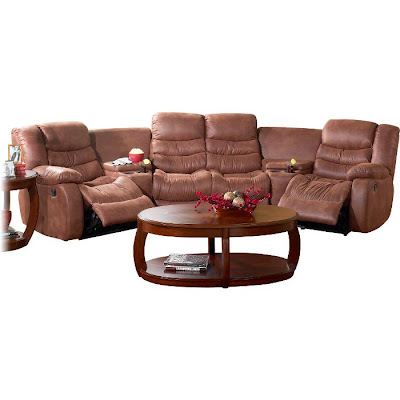 So can a family room be comfortable and functional without compromising on design and style? Paul, this catch22 is one of the many issues that led us to wanting to work with you. Hey Dustin! 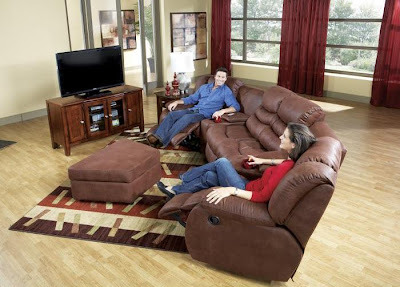 Design, style, comfort and function are all the same thing at the end of the day. Good design IS stylish, it IS comfortable and it IS functional. Thanks again for seeking me out. I cannot wait to get started. We sure hope you'll prove that point to us firsthand. With the smaller size of our home and the open floorplan we're just hoping our TV and computer are not eyesores to the new improvements. We can't wait either Paul. Hopefully only a couple more weeks. Good job on the Hancock and Moore sofa and chair. Spend a little time looking over Room and Board's offerings. I have never been disappointed in anything I've specified from there. Pity the closest showroom to us is in Atlanta.